Jewcology - | Hineni, I’m back! Some of you may have noticed that I have not been as consistent in my blogging on Jewcology recently, and any of you on my mailing list will not have seen promotional e-mails from me in months. This is because for the past year I have been focused on another project, making Vancouver a cool place to be young and Jewish. It has been a great challenge, but has taken me away from Jewcology and my core passion and pursuits. Unfortunately, my job at the Jewish Federation has come to an end, while there is still much more work to be done. However, this shift is allowing me to get back to my core work and passion, teaching about the connection between Jewish ethics and environmental sustainability. Hineni, I am here, I am back! Over the next months, I promise to come back strong. 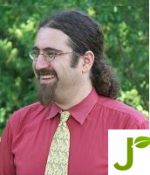 With new blogs, curriculum and programming on Jewcology that will push the Jewish community on issues of climate change, protecting Israel’s environment, food ethics and much more. Over the next months, I will be hitting the road again, bringing my engaging form of Jewish education to communities such as New York, Boston, Chicago, Toronto & Ottawa. Make sure your community is on my ‘hit list’, if you are not, please be in touch. Hearing about what has happened in the last year and finding my role. So look out, I may be contacting you. Jewcology recent fundraising success continues to prove how important this work is. I am delighted to be back helping to grow this field and helping deal with the greatest problem facing humanity and through extension the Jews, in our lifetime. Website looks great, and I like the “Listen to Noam” link to the radio show interview — and the caricature of you!